The microscopic preparation and analysis processes available at IKV cover the entire range that is of relevance for plastics analysis, with a view to obtaining meaningful results quickly and reliably. Of key importance here is the preparation of the specimen. The Institute possesses a broad knowledge base for obtaining reliable test results within the shortest possible time due, not least, to its day-to-day involvement in public research projects and the time it spends dealing with wide-ranging questions from industry. Fourier transform infrared spectroscopy (FTIR) is in most cases a non-destructive standard process for the identification of (semi-)organic substances and thus also of plastics, coatings and contamination. To characterise inorganic substances such as fillers, one option is to use energy-dispersive X-ray structural analysis (EDX). This form of near-surface elementary analysis (≥ atomic number 6) can be performed either at a specific point or over a defined area. 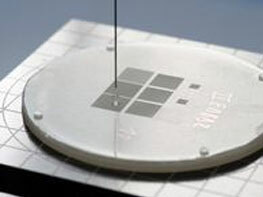 Using electron spectroscopy for chemical analysis (ESCA) – also known as X-ray photoelectron spectroscopy (XPS) – an elementary analysis (≥ atomic number 3) of the surface and thus of the first few nanometres is carried out. 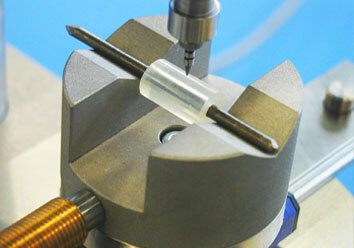 Mechanical testing is an important tool for product testing and quality assurance. 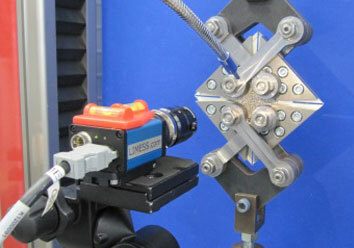 To describe the mechanical properties of construction materials, testing methods such as tensile tests, notched flexural impact testing and hardness testing are fundamental and frequently used methods. The deployment of universal testing machines allows both standardised testing processes and individual component tests. 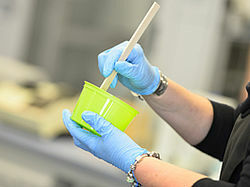 Additional external influences on the plastic such as climate and media have to be taken into account at the test planning stage and when preparing the specimens. The mechanical tests are frequently preceded by sample preparation, ageing by UV radiation and weathering in conditioning cabinets. 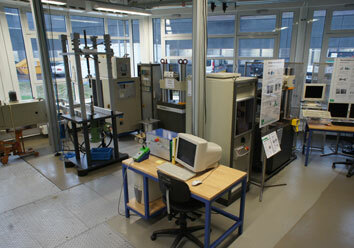 Furthermore, some areas of the laboratory are ideally equipped for various long-time and dynamic tests. 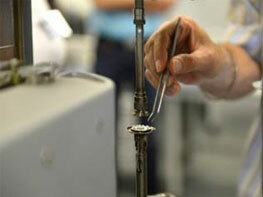 Throughout the laboratory, testing is carried out on thermoplastics thermosets and fibre composites. 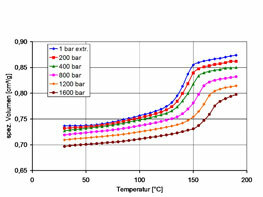 The many different thermal analysis methods provide valuable assistance in recognising complex relationships between the processing, structure and properties of the plastics. By means of thermal analysis, polymers can be identified and characterised, and the influences of processing and material damage can be detected. 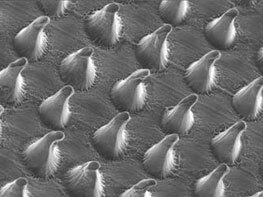 The methods are used for a wide variety of different materials, e.g. thermoplastics, thermosetting plastics, elastomers, resin and adhesive systems, foodstuffs, pharmaceuticals, building materials, etc. etc. 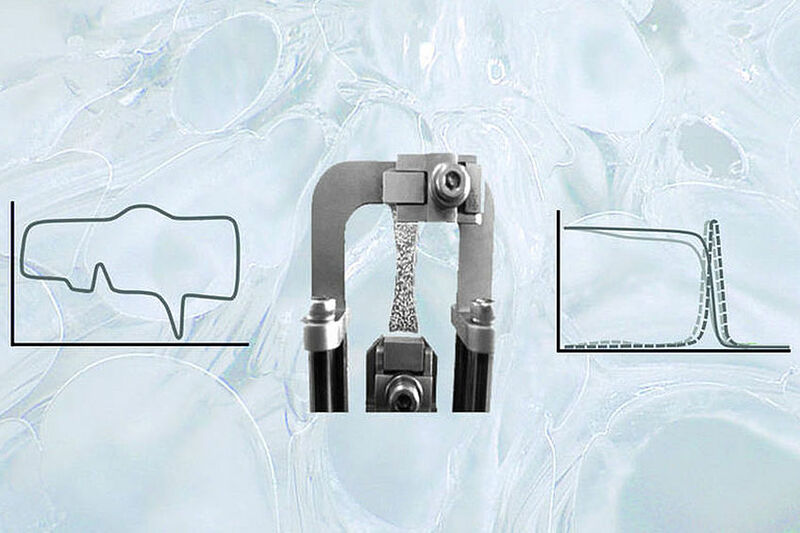 Knowledge of the flow behaviour of plastic melts and rubber or silicone materials and information on the viscosity of resin systems is essential to be able to accurately design the processing processes. 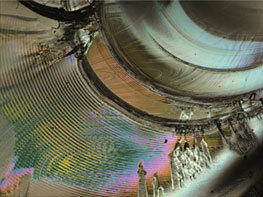 Apart from determining the actual viscosity, it is also possible to measure their elastic and viscous proportions. This yields, for example, important information on the extent to which a plastic melt reacts to shear loads through a rise in temperature. 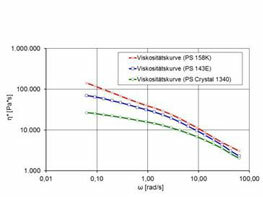 Since the viscosity of a plastic is the product of many individual properties (molecular weight distribution, degree of branching, additives), it is also possible with rheometric methods to detect batch fluctuations on a comparative basis. 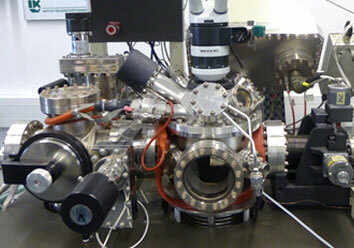 Especially oscillatory measurements offer a large number of possibilities for describing materials. For this, preliminary trials are necessary to find a suitable individual operating point of the interaction system between rheometer and material. Determining physical properties and material characteristics is of major importance in plastics analysis whenever process design and/or process parameters are involved. Furthermore, this information serves to give a deeper understanding of the material, which is necessary above all for predicting its behaviour in later application. 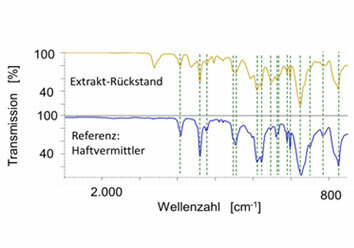 Thus the physical properties of a material to be processed such as its shrinkage behaviour and (residual) moisture provide important information about the polymer and about the reactive systems. 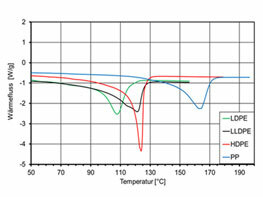 With regard to targeted application possibilities, factors such as thermal conductivity and barrier properties play a major role. In other circumstances, the focus could be on such properties as the wetting behaviour in contact with hydrophilic/hydrophobic media, or on colour and gloss differences. Also in the field of failure and damage analysis, a determination of the physical properties of a part and/or the starting material can contribute to clarifying the failure or the cause of failure.